Nothing can beat those unexpected moments of joy when we come upon one of nature’s wonders right under our noses. Recently I had the pleasure of sharing an early morning walk with (as well as the dog) one of our most beautiful native birds, the Owl. Caught up in the moment I completely forgot just how cold it was as the sight stopped me in my tracks and I watched this master of the skies swooping so close I could hear the dull thud of his wings. He perched for a while on a nearby branch and swivelled his head round one way and then the other. It’s not difficult to see why this magical bird is linked to the moon. There it was in his face. 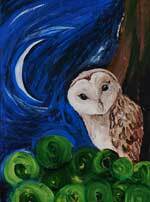 And it was a full moon that night too, how about that for some Owly moon magic?! We cannot ignore these signs in nature as they prompt us to wonder and muse upon the hidden knowledge that lies deep within. It is not something beyond our reach and will reveal itself if we can just open ourselves to it. When we find ourselves walking a Magical path and are ready to move ahead we come upon the door of Untold Knowledge. It is here that we will recognise the Owl for who he really is; as the guardian of ancient truths and the keeper of secrets. He stands at the door of wisdom to reveal his message to us and we will we sense this if we are ready. We will feel it in our blood and bones and with his guidance we will know it. We may sense sudden flashes of insight, gleams of information that appear without forethought of any kind. Our dreams may be particularly vivid, powerful and recurring. We will feel the pull of our psychic energy being drawn in the direction of the occult and magical arts. Remember that this will take us beyond ordinary knowledge or experience as we gravitate towards the hidden realms and the knowledge contained therein. These are the stirrings of the unknown that dwell beneath the surface of our conscious minds and call to us from the deep. It is often here that we hesitate because in this landscape we do not understand where we are. It is unknown and before we know it, we are cloaked in the darkness of fear. We need a guiding light to show us the way. This is when, if you ask for the guidance, it will appear. Don’t let fear get in your way. Your voice will always be heard on the inner planes and help is closer at hand than you think. But the language of the magical domain is subtle and these great beings of light come in many forms and signs. Therefore the more you can attune yourself to them by knowing and reading the signs – the easier it will become. The Owl is a great teacher but you must put in the spade work yourself, delve deeper and stand back. Observing from all angles, the secrets will reveal themselves and you will know the truth. Any journey into unknown territory will always bring up some aspects of fear, it’s only natural. Working with Owl as a protector and guide will help to eliminate any self-doubt and uncertainty before they become blocks on your magical path. He reminds you that to strengthen your intuition and psychic ability you must acknowledge it and give it the respect it deserves. Only then will you learn to trust and act upon it. How will you know the guidance is authentic? This question comes up time and again. Quite simply, if it comes from a loving place, you will feel it in your own – the heart space. All true spirit guides operate and connect with us on a love vibration. This is a spiritual truth. You will learn to know and discern the truth by focusing on it and developing your faith. The blending of love and faith has the effect of opening up a direct line of communication to Infinite Intelligence and the Owl is the messenger of this magical domain. What is the point in developing yourself, in honing your psychic awareness; if you don’t act upon it? None at all! You might as well have not bothered. Action is imperative to progress. You will only move forward on your magical path if you use the guidance shown to you. Working with a nature guide really helps to ground the psychic energy so that it’s earthed. This enables you to integrate it into the physical and use it to experience life to the full. Have your head up in the clouds by all means- and believe me the owl can take you to great heights – but keep those feet firmly on terra firma if you want to lead an integrated life otherwise you’ll stay floating around in the ether, completely ungrounded. What if you make a mistake? Of course you’ll make mistakes… it’s how you learn. Only by doing will you get better at being. 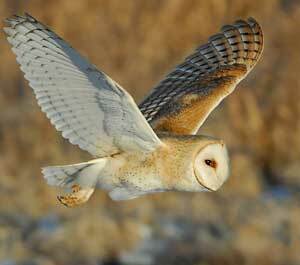 The Owl can sharpen your intuition like a knife if you let him. But he cannot act for you! Working with this wonder of nature as a guide through meditation and contemplation will strengthen your confidence in your intuition as a tool of the magical mind. Developing this skill will enable you to know what to do and when you need to do it. It is your inner compass and will take you as far as you want to go and as far as your Soul needs to grow. As this wise old bird uncovers the secrets of the unconscious into your awareness you will learn to navigate the inner realms and trust in its subtle and yet powerful, energies. He doesn’t show up for nothing but to let you know that his very presence is an acknowledgement of the heightening of your own magical power. Think about this. You know more than you think you do and you are more powerful than you can imagine. It is one thing being told that you have the power, but it’s another thing using it. What will you do? Sometimes we have to push ourselves, move past that fear and out of our comfort zones. Because maybe then, if we really want to create Magic in our lives, is when it happens. May blessings of Owly Wisdom be yours! Spirit Guides – Are They For Real? This entry was posted in Featured Posts and tagged ancients, darkness, heart, intuition, love, meditation, occult, psychic, vibration, wisdom. Bookmark the permalink.